Welcome to Catalogue #217. Ah April! Doncha just love it! The autumn breezes have blown the WA heat away and we can at last rest easily at night. It’s a long haul here in WA, from September to April, as hot as hades in February and just hot the rest of the time. But…I’m not whinging knowing what thousands of people have gone through with bush fires and flooding rains. There’s always someone worse off than us here in the West. April this year is a momentous month for me and my mates who will be celebrating our 50th anniversary from the Vietnam scuffle. 3 SAS Sqn, under Reg Beesley, was up to our necks in shell and shot in 1969. So…to books. Quite a few in this list which I’ve never listed and many old standards of course. The images on the front cover are books by and about Barry Petersen and I’ve only got one copy of each. We’ve had some remarkable men appear in all our wars of the 20th century and beyond. Needless to say VC recipients figure prominently in all of these actions. 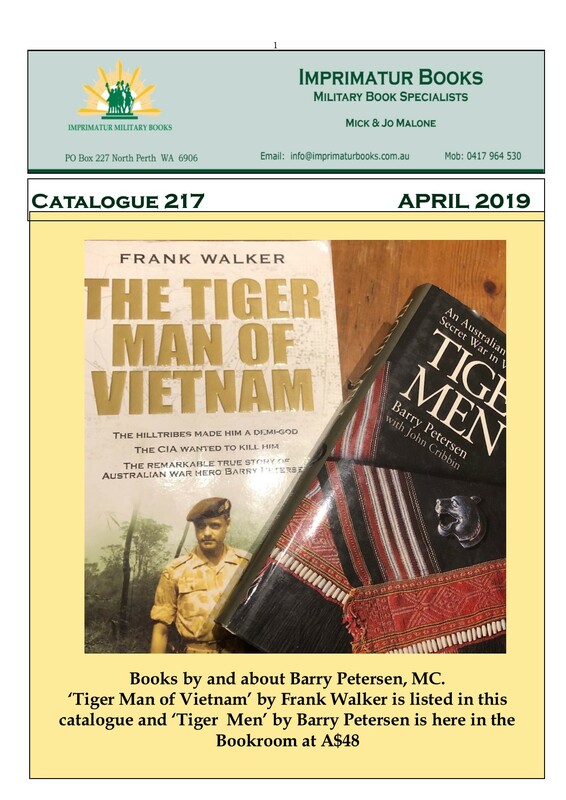 Some of the more memorable include: Jacka, Mad Harry, et al in WW1; Kingsbury, the Diver (DCM); Starcevich in WW2; Horrie Madden in Korea (GC); Simmo, Badcoe, Dasher, Payne and Barry Peterson (MC) in Vietnam. This century we’ve seen four supermen receive the VC; Donaldson, Roberts-Smith, MG; Keighan and Baird, MG. (Post). This coming ANZAC Day we will remember them all for their unbridled gallantry. So stay well my friends and be kind to all.